The purpose of the following guidance is to provide University of Virginia (UVA) researchers who work with or intend to work with nanomaterials information regarding key environmental health and safety implications and to help facilitate their safe use. What is nanotechnology and what are nanomaterials? Nanotechnology: The National Nanotechnology Initiative defines nanotechnology as "science, engineering and technology conducted at the nanoscale, which is about 1 to 100 nanometers" It goes on to say "At the nanoscale, the physical, chemical, and biological properties of materials differ in fundamental and valuable ways from the properties of individual atoms and molecules or bulk matter". For context, consider that the diameter of DNA is in the 2.5 nanometer range (a nanometer is 10-9 m, or one-billionth of a meter). Naturally Occurring Nanomaterial: Matter at this scale is not new and exists in nature, such as particles that make up smoke, and in the biological realm as viruses. In the health and safety realm, nanoscale materials are often referred to as "ultrafine particles". There have been documented instances of negative health outcomes for people exposed to nanoscale materials. The focus of EHS’s guidance, however, is the on the environmental health and safety implications of working with engineered nanomaterials created for research purposes. Engineered Nanomaterial: Engineered nanomaterial is intentionally produced material with any external dimension that is nanoscale. Nanomaterials have many commercial applications, including electronic, biomedical, pharmaceutical, cosmetic, energy, and advanced materials. Federal organizations continue to increase their investment in nanotechnology research; with new innovations using nanomaterials, there is potential for unforeseen environmental issues or occupational hazards. Considering that the long-term health and environmental implications for exposure to engineered nanomaterials is not yet well characterized, researchers using nanoscale materials should take steps to limit their exposure. Can Engineered Nanomaterials be worked with safely? Yes, engineered nanomaterials can be worked with safely by taking into account the properties of the materials, and taking a methodical approach to managing the risk of exposure. It is important that researchers who intend to work with nanomaterials take the time to make a plan to address the unique problems nanomaterials pose. What are some safety considerations that are unique to working with engineered nanomaterials? 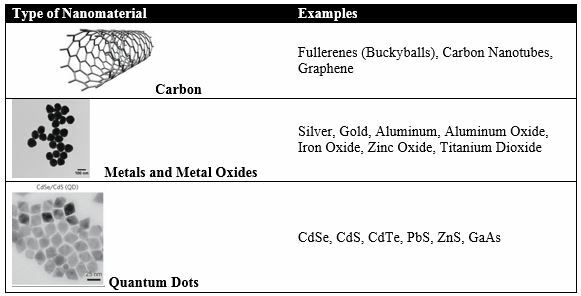 Hazard identification can be difficult due to the variable nature of the physicochemical characteristics of each nanomaterial; however, the smallness of nanomaterials does inform the approach to minimizing risk. The small size of nanoparticles lend themselves to being suspended in air, if present in the form of fine particles; it is for this reason that inhalation is generally considered the primary concern when evaluating routes of exposure. Skin exposure and the passing of nanomaterials into the blood-stream is another serious concern. The severity of the exposure depends on the state of the material. Free nanoparticles suspended in the air pose a much greater inhalation hazard than nanoparticles which are wetted in a liquid suspension, or bound in a ceramic or polymer matrix. The potential health risk following exposure to a substance is generally associated with the magnitude and duration of the exposure, the persistence of the material in the body, the inherent toxicity of the material, and the susceptibility or health status of the person. The uncertainties regarding health risks with exposures to nanomaterials arise because of the gaps in knowledge about routes of exposure, the fate of these materials once they are inside the body, and the variability of toxicity of the nanomaterials. Because of these uncertainties, it is important that precautionary measures be taken to minimize exposures. Often the information contained in a safety data sheet (SDS) is more relevant to the properties of the bulk material, rather than the nanoscale material; as such, the information, while valuable, may not provide the most accurate or helpful information. Since the potential health effects from exposure to nanoparticles are not fully understood, it is important to follow the precautionary principles and use procedures that minimize all routes of exposure (inhalation, skin contact, and ingestion). Working with nanomaterials in liquid media during pouring or mixing operations. Where a high degree of agitation is involved, grinding or degrading nanomaterials embedded in a solid matrix. Generating nanoparticles in the gas phase in non-enclosed systems . Maintenance work on equipment used to produce or fabricate nanomaterials and the cleaning of dust collection systems used to capture nanoparticles also have the potential to aerosolize particles and should be considered as a potential source of inhalation exposure. When possible, select nanomaterials bound in a matrix, or suspended in liquids or polymers. Develop an SOP for how you plan to handle each type of nanomaterial. Wet wipe work surfaces and containers that have been used to handle nanomaterials with disposable cloths at the end of each task. Choose a compatible liquid and dispose of any cleaning material as hazardous waste. Work areas can be lined with an absorbent pad or antistatic paper to facilitate cleanup of contamination. Do not eat or drink in areas where nanomaterials are handled or processed. Wash hands thoroughly with soap and water when you have completed experimental procedures and before leaving the laboratory. Avoid processes that generate significant quantities of dust, as fires and explosions are a safety concern with nanoparticles. Engineering controls designed for gaseous containment to prevent inhalation exposure during these types of activities, such as biosafety cabinets, chemical fume hoods or glove boxes should be suitable to minimize personal exposure. Respiratory protection can be employed when engineering controls are not feasible during processes that potentially generate aerosolized particles. However, respirators may only be used within the context of the University Respiratory Protection Program (which includes a medical evaluation, fit testing and training). Please consult our webpage for the Respiratory Protection Program. Wear gloves when handling or working with nanomaterials. When working with nanomaterials in liquid media, be sure to select gloves that have good chemical resistance to the solvent the particles are suspended in. Double-gloving may be necessary when extensive skin contact is anticipated. In the case of a spill, avoid activities that may further create airborne nanoparticles, such as sweeping. Instead utilize wet methods or a HEPA filtered vacuum. Please contact EHS at 982-4911 if you are uncertain how to proceed. Any nanomaterial, waste containing nanomaterials, and wet wipes used to clean contamination shall be disposed of through EHS with a description of the nanomaterial and any associated waste. The following link can be used to submit a request for waste pick up or empty waste containers. There are a number of resources available online that provide information on current research on the toxicity of nanomaterials and current best practices when working with nanomaterials. The list of websites and articles of interest is not exhaustive. Anyone conducting nanomaterial-related research on grounds may contact EHS, so that we may observe laboratory practices and assist personnel in evaluating any processes with potential for exposure. If you have questions or concerns about nanomaterial research, contact EHS at 434-982-4911. Good Nano Guide – Collaborative platform specifically designed to enhance the ability to exchange ideas on how best to handle nanomaterials in an occupational setting.